In 415 BC famous tragedian Euripides wrote a play called The Trojan Women. It was his anti-war protest against his own state’s capture of the island Melos by hand its subsequent slaughter and subjugation of the people of Melos. The play has been revived multiple times, recently in the context of the Syrian war. The Queens of Syria (2016, dir. Yasmin Fedda) is a documentary about the production process of the play inspired by the parallel experiences of the Trojan women and the Syrian women. 50 Syrian women who have been forced to flee their homes decided to take part in a project which was both exciting and scary at the same time. They had never acted before, but in fact, they did not need experience in acting for this particular play. The stories they told were their own. Even if at times they were telling those stories through the words of The Trojan Women, they were still theirs. The combination of Euripides’ original text and personal stories of death, terror and grieve created a modern re-telling of an ancient play. As one of the women said, ‘We come from Troy of this age …’In the beginning, 60 women were willing to participate, but the numbers kept dropping as time went by. 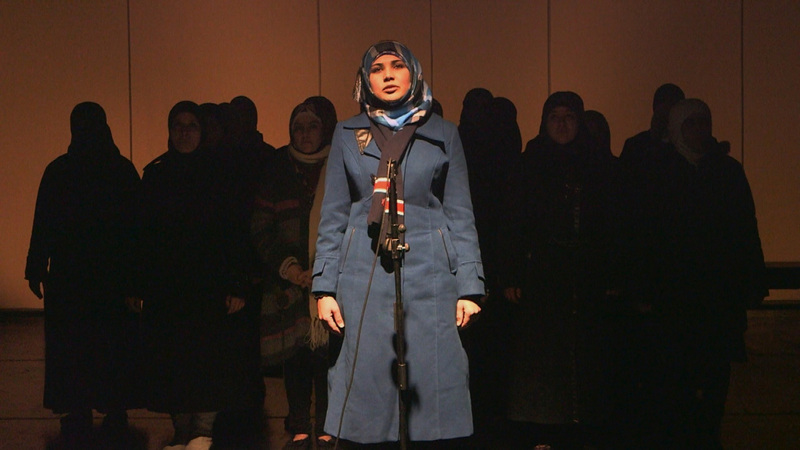 The women were most afraid of the political repercussions they could have faced, and in the end, there were about 20 women who performed in their premiere in Amman in 2013. The Queens of Syria shows the ‘behind the scenes’. We get to know the women’s families, their worries and hopes. We learn about the lives they had to leave behind in Syria – lives which they reminisce throughout the film. One of the women said, ‘We were all queens in our own homes’, but it was all taken away from them. In one part of the play, one woman reads a letter to her house she had to escape from. She remembers all the little details of decoration, windows and furniture. She misses it, but she also knows that the return is impossible as they proclaim in a play, ‘Each of us has lost what is dear to them. The Troy exists no more!’. The screening took place at Lancaster University thanks to one of the students. After the film, the audience had the opportunity to ask questions as the co-producer William Stirling was present at the screening. It was interesting to hear about how the production of The Queens of Syria served as somewhat of a group therapy session for the actresses who, after all, had to tell dramatic stories which were not fantasy, but a brutal reality. A psychiatrist was present during their preparations of the play, especially in the early stages and confirmed that the women became much more confident and the whole experience was tremendously helpful in dealing with their tragic histories. The Queens of Syria humanised ‘the Syrian refugee’. It seems like in the media we can only see one stereotypical image of ‘a refugee’ or rather ‘refugees’ – they are often presented as this mass invading European countries, and it is not common to hear their stories from a different angle. The angle of The Queens of Syria showed the current events and stories as well as presented dreadful consequences of war in the 21st century Syria which has not changed much since the times of war in the 5th century BC ancient Greece.